Buy 1 for $16.06Buy 2 / Save $0.86!Buy 3 / Save $3.21! 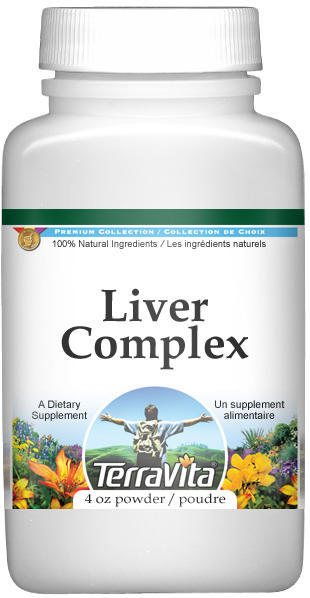 Liver Complex powder consists of an entire combination of herbals all established as tonics and purifiers for the bile-secreting liver organ, the gallbladder, and the digestion system. Parsley (Genus Petroselinum) is a diuretic and has been shown to have anti-bacterial and antimycotic effects in vitro; it's been utilized in lots of belly issues, including liver organ, the kidney organ, and spleen ailments. Rosehips reinforces the kidney organ, liver organ and adrenal gland mainly while being an antioxidant in addition, to a high source of iron and vitamin C. The bitter substances of barberry, fennel (Foeniculum vulgare), and Taraxacum ruderalia encourage digestion and current herbal research mentions their uses for digestion problems and liver organ issues, and cases of yellowness of the skin and liver health concerns. Getting better digestive fluid flow is important for proper digestion, and will lessen excessive accumulation of fluids within the bile-secreting liver organ and lessen the possibility of any bacterial or parasitic attack, and here's where the detoxing and helping to stimulate movement of Armoracia rusticana tuber is very recommended. Beet tuber is a strong blood air purifier and its detoxifying attributes are treasured for removing any barricades from the liver organ or digestion pathway. Discomfort due to gastric hyperacidity may occur. In case of gallstones or obstruction of the bile ducts, gallbladder, or bile ducts seek professional medical advice before consumption. Do not take large quantities at one time as it can cause diarrhea and excessive sweating. Do not take if you are pregnant, lactating or have thyroid problems, ulcers or kidney disease. Do not use parsley if you have a kidney infection. "Barberry: Plant May Hold Key To Ultimate Antibiotic."